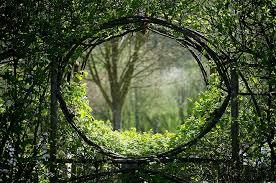 Home outside play Dreaming of a Moon Gate. Dreaming of a Moon Gate. Fall. My favorite time of year. A great time to work outside as it is not too hot and one is motivated to get things organized and ready for winter. Our property is literally surrounded by a forest. When we bought this seven acres years ago we cleared an area in the middle of it and that is where we built our house and garden. There is an area in the front of the house we call the meadow. We mow it, but it is not a manicured fancy lawn and never will be. Our property is rustic and we like it that way. I have always dreamed of having some clearly marked paths through the woods that could be maintained and therefore used easily. One of my ways to decompress is to amble through the forest and let nature work its wonder. The task of clearing paths through seven acres of the forest is daunting so today I picked one area and got busy.Snipping and sawing and raking. I was quite pleased with the progress I made. I piled lots of brush. About ten piles in this section. My son, who is visiting this week, and Darrell, helped me haul all the piles to the burn pile. No burning will happen yet until it rains a lot. After the summer we have had in B.C. it's just too risky. Our kids are all grown and their tree house is sadly rotting. I had the idea that I would like to transform this area into a moon gate. A moon gate is a circular opening in a garden that acts as a pedestrian passageway and a traditional architectural element in Chinese gardens. There are many images to be found on the internet and this is what we thought might suit our place. It might not look quite like this and I might have to wait a while for the construction to happen, but it doesn't hurt to dream a little. Meanwhile, I'll keep going with raking, clearing, and piling.